Singularity is a delay effect unlike any other. It starts with a tempo-synchronised feedback delay line capable of true stereo panning, and its tail is then sent into three extremely capable effect units connected in series. Each of these processors includes a rich selection of different algorithms: from filters, phasers and choruses to digital- and analog-style distortion, frequency shifter and granulator. In addition to all this, Singularity has four modulation generators for parameter animation – all of which lets you create extremely sophisticated, out-of-this-world delay, echo and even reverb effects. As always with Sinevibes plugins, Singularity’s user interface is built using high-contrast, colour-coded elements with lively animations and efficient rendering. Delay, effects and modulators feature interactive graphics which let you understand what’s going on just after a quick glance. Together with thoroughly calibrated parameters with realtime smoothing, Singularity is a bliss to operate in any environment – and in any mood. 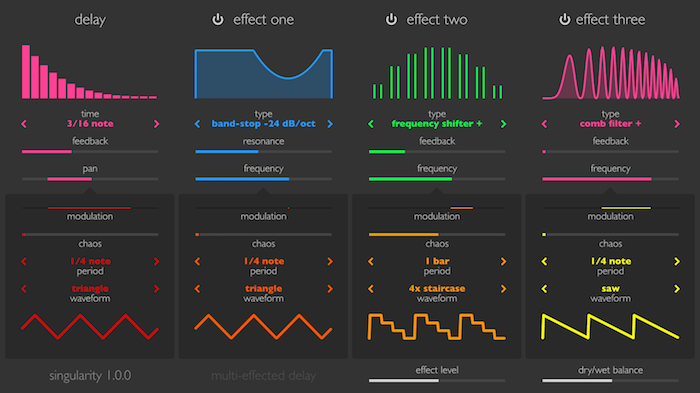 – Added new pitch shifter effect algorithm. – Added delay line into frequency shifter feedback. Singularity works with Logic, GarageBand, Live, MainStage, ReNoise, Reaper, Studio One, Digital Performer, Tracktion and other software that supports Audio Unit effect plugins. It comes in 32/64 bit format for Intel Macs running OS X 10.6 or later, and supports Retina screen resolution.